The Basics - FITZGERALD LAW GROUP, P.C. Generally speaking, every parcel of real estate in Cook County is reassessed every three years. Some properties are reassessed more often depending upon the circumstances. Factors such as new construction, physical modifications, vacancy, a tax division or consolidation of a parcel, recent sale, etc. may cause the assessor to reassess a real estate parcel more frequently. The Cook County Assessor is Mr. Fritz Kaegi (D). He was elected on November 6, 2018 and sworn in as the 10th Assessor of Cook County on December 3, 2018. The current members of the Cook County Board of Review (presented in alphabetical order) are Mr. Michael M. Cabonargi (D), Mr. Dan Patlak (R) and Mr. Larry R. Rogers, Jr. (D). There is a two step process. The Cook County Assessor’s Office is the government agency charged with assessing each property at a value reflective of fair market value while the Cook County Board of Review is the agency charged with insuring that assessments are fair and equal. A notice of proposed assessed valuation is mailed to the taxpayer of record and the taxpayer has an opportunity to appeal the assessment. This appeal can be initiated at either the Assessor level or Board of Review level. Each agency has its own procedural and substantive rules. Many of these rules are published and some of them are not. The Assessor level appeal can be filed by the taxpayer, their representative or their attorney. An appeal at the Board of Review level may only be filed by the taxpayer if she or he is acting as an individual taxpayer or an attorney. Both agencies have the right to increase the assessment. A decision by the Assessor may be appealed to the Cook County Board of Review, which serves as the quality control component of the assessment process. The Board of Review applies a Uniform Market Value standard to all commercial, industrial and investment grade properties before it. 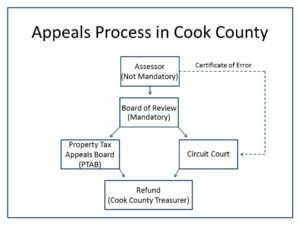 Board of Review decisions that are considered adverse may be appealed to the Property Tax Appeal Board or in the Circuit Court of Cook County. The basic object at each level is to prove that the assessed valuation levied against the subject property is excessive. The type of evidence offered as such proof varies and depends upon the unique circumstances surrounding each property. Below are listed specific situations and the type of evidence likely to achieve the most cost effective results. Leasehold Lease analysis or appraisal. Vacant land Uniformity analysis or recent appraisal. Recent sale Closing documents and proof that the transaction was arms-length. Vacancy (over 20%) Affidavit and other evidence of vacancy including a field check request. Classification Affidavit, other relevant evidence and field check request. A device to encourage certain types of property development. Typically forgives all or a portion of the property tax bill for a specific time period. An appraisal is an opinion of value by a qualified individual. Appraisals over 2 years old are generally not considered persuasive evidence. Appraisals of properties valued at $500,000 or greater should include the three traditional approaches to value. The difference between a MAI appraisal (Member Appraisal Institute) or CAE appraisals and non MAI or CAE appraisals can be substantial in terms of quality, cost and credibility. Neither Cook County assessing authority requires the use of an MAI or CAE appraisal. Their only requirement is that the appraiser be licensed. A list of our currently approved appraisers is located on this website. This list is updated continually. Fitzgerald Law Group encourages clients to engage their own appraisers,subject to prior approval by Fitzgerald LG. Such appraisals often are equal in terms of quality to those produced by an appraiser on our approved list. Of course, outside appraisers must conform to our standards in terms of methodology and procedures. That number which is the basis of the tax bill. It is derived by multiplying the market value by the assessment rate. 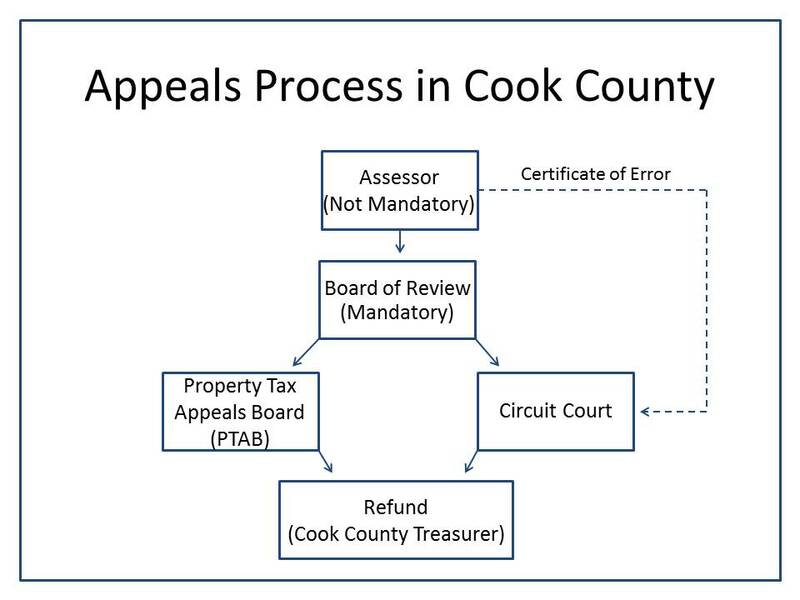 A procedure invoked by the Cook County Assessor whereby they levy an assessment on a parcel because it was improperly classified as exempt or vacant. Notices are generally sent to the taxpayer of record and hearings are held soon after. The tax bill is usually issued with a 10% penalty added on for each omitted tax year. The county agency charged with insuring that the assessments established by the assessor are fair, equitable and uniform. A procedure which permits a taxpayer to apply for a partial tax refund based upon an excessive assessed valuation. The procedure is generally available for assessments going back 1 to 3 years and requires various administrative and / or judicial approval. A tax subsidy to certain owners or for special uses of property for the purpose of encouraging publicly desired objectives. In Illinois, private schools, not-for-profit hospitals, HMO’s and churches are examples of uses which may qualify for an exemption. A written itemized list of the cost to redeem property taxes which have been sold at the tax sale. May be obtained from the Cook County Clerk 4th Floor 118 N. Clark St. Chicago, IL 60602. Cook County does not offer tax incentives to buildings that are LEED Certified. All assessing officials require 3 years of income and expenses in the form of IRS returns or certified financial statements. Each agency requires that the financial data be reflective of the market thus, income derived from a below market lease will not be considered as evidence. The Leadership in Energy and Environmental Design (LEED) Green Building Rating System, developed by the U.S. Green Building Council (USGBC), provides a suite of standards for environmentally sustainable construction. Since its inception in 1998, LEED has grown to encompass more than 14,000 projects in 50 US States and 30 countries covering 1.062 billion square feet (99 km²) of development area. The hallmark of LEED is that it is an open and transparent process where the technical criteria proposed by the LEED committees are publicly reviewed for approval by the more than 10,000 membership organizations that currently constitute the USGBC. Cook County does not at this time offer tax incentives to encourage LEED certification. That number derived by dividing the assessed value by the assessment rate. A mathematical formula applied to tax bills, which in theory, satisfies the state requirement that all real estate be assessed at 33% of its Fair Market Value. 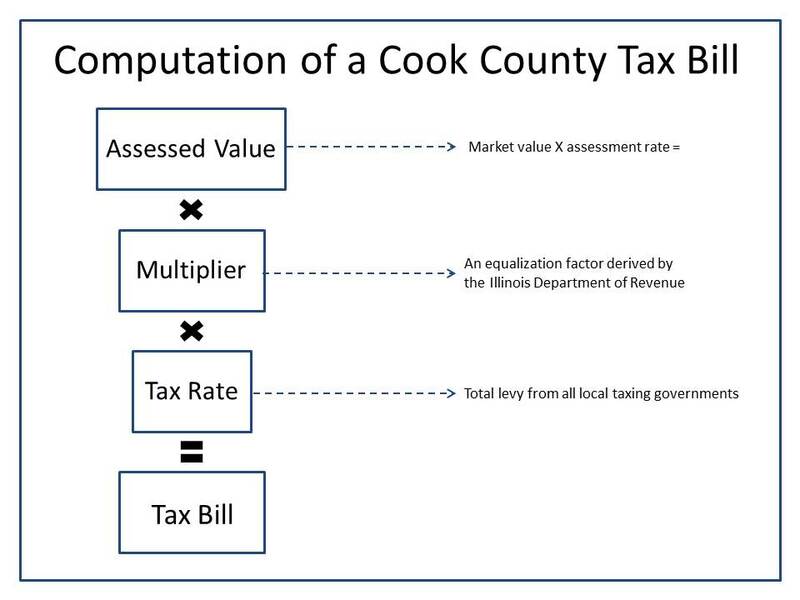 The multiplier is developed each year by the Illinois Department of Revenue after analysis of sales-ratio studies. An acronym for Online Dispute Resolution, a platform being increasingly by local governments to manage appeals of property assessments. The most sophisticated platform is Modria, developed in 2011 under a license from Ebay. The name stands for “modular online dispute resolution implementation”. Below are listed those officials that play an important role in some aspect of the Cook County taxing process. A method of paying a tax bill for a property which has been recently sub-divided and does not yet have its own PIN. A state agency consisting of 5 board members, appointed by the governor, which reviews and if necessary, revises assessments. Such revisions result in a tax refund. An agency of the city of Chicago which primarily functions as an intervenor in property tax appeals. A procedure whereby the owner or some other party with an equitable interest in the property, redeems the unpaid property taxes or special assessments which have been sold by the county. In Illinois there is a presumption that the sale price of a property is arms length and that it is indicative of market value. Since assessing officials are required to assess a property at its fair market value, potential purchasers of commercial and investment grade real estate should not be surprised if the property is reassessed soon after the transaction is completed and that the sale price will be a factor used by the Assessor in determining the new assessment. Accordingly, the projected tax load should be factored into the economics of the transaction before the purchase agreement is entered into. Fitzgerald LG does prior to purchase tax projections. There are certain procedures that a lawyer can perform for the benefit of the purchaser. The most effective is an allocation clause; whereby the parties to the transaction allocate a certain amount of value to land/improvements, personal property, intangible concepts or favorable financing from the seller. Of course, there is an obligation of good faith on the part of the parties and an expectation that the purchaser be able to back up her/his allocation with a high quality appraisal. There are other factors to be considered such as, IRS depreciation and/or 1031 exchange requirements including Tenant in Common investments and the lenders requirement for collateral. It is recommended that the attorney for the purchaser consult with the purchasers income tax advisors as well as property tax counsel, prior to drafting an allocation clause. The special assessment tax is often confused with the property tax. These are two distinct forms of taxation: one (ad valorem tax) relies upon the fair market value of the property being taxed for justification, and the other (special assessment) relies upon a special enhancement called a “benefit” for its justification. A special services area is a defined area within which businesses pay an additional tax or fee in order to fund improvements within the district’s boundaries. Grant funds acquired by the municipality for special programs and/or incentives such as tax abatements can be made available to assist businesses or to recruit new business. SSAs may go by other names, such as business improvement area (BIA), business revitalization zone (BRZ), community improvement district (CID), or special improvement district (SID). A Community Benefit District (CBD), is much like a SSA except property owners, not the businesses, vote to pay an additional property tax assessment. BIDs provide services, such as cleaning streets, providing security, making capital improvements, construction of pedestrian and streetscape enhancements, and marketing the area. The services provided by SSAs are supplemental to those already provided by the municipality. 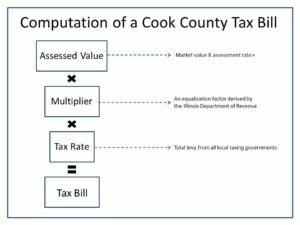 A program which was launched by a former Cook County assessor, with great fanfare and with the intent to put tax delinquent properties back on the tax roles. Limited to 180 square miles in Calumet, Bloom, Bremen, Rich and Thornton Townships, the program, in its 21st year, needs more support. As of April 2015, only 17 businesses have taken advantage of this program. The reasons for such lack of participation are multiple. Namely, even after all tax incentives have been factored in, the bottom line tax bill is excessive. Due to the local tax rates, a tax bill may be more than double that that of a comparable property in the city of Chicago. A vehicle which is supposed to provide for the financing of public or private projects in areas that are hard pressed to find to attract investors. In reality, it has become a slush fund for politicians pet projects. A concept whereby the state income tax is increased and a corresponding credit is given toward one’s property tax bill. The object being to provide some revenue relief for school districts with a declining tax base. All attempts to enact enabling legislation have been defeated. This parameter is used by assessing officials to levy a value upon single family houses, condominiums and land. When performing an analysis of land on the basis of uniformity, it is important to use only comparable’s which are similar to the subject property in matters of zoning, size, frontage and location. Theoretically, uniformity is not used for income-producing properties and Class 5 properties because they are considered “unique” and thus not capable of being compared to other nearby properties. The old “Letter Property” system came back under a new name “Unique Property” program. 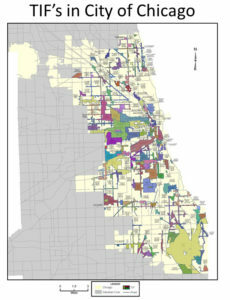 Under this program, which was announced in 2003, the Cook County Assessor has identified 300 properties they deem “unique and difficult to assess”. Since then the Cook County Assessor has reduced the number of properties on that list to about 125 properties during 2015. 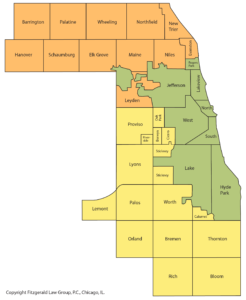 That standard employed by the Cook County Board of Review when they review the assessments levied against commercial, industrial and investment grade properties. Derived by capitalizing the potential income stream and then averaging it with other nearby comparable properties. The occupancy of a property may serve as ground for relief provided that objective evidence of the vacancy problem can be documented and if over 20% of the property was vacant during the tax year. Copies of old leases, utility bills, photographs and other types of evidence will be considered by the assessing officials. It is important to note that under new rules put forth by the Cook County Assessor’s Office in 2017, the vacancy must be the direct result of a remodeling project or the inability to lease the property despite diligent efforts.